Stop Overthinking and Take Action! Hello everyone! It’s September, which for me, means it marks another year my wife made an arguably questionable decision to spend the rest of her life with me. 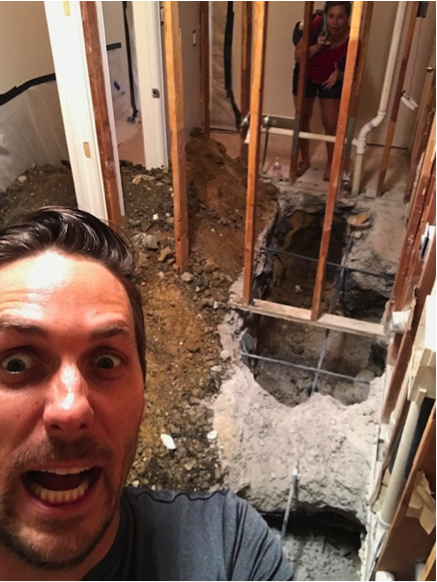 As we celebrate 9 glorious years, we thought a good way to celebrate would be to embark on a fairly large home remodeling project. There is literally dust everywhere, tools lying in random rooms around the house, and a general sense of disorganized chaos at levels not previously seen before in our home(¹). Trust me…..she’s questioning her decision! (Hopefully not, but I wouldn’t blame her). 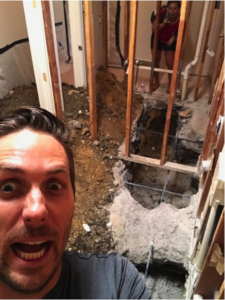 Anyways, recently I sent Megan and the kids packing for the Midwest to visit family while I stayed back in Dallas and put in multiple days of work to get the most-intrusive portions of the remodel done. The goal was to get it done to a point where we could finally start putting the house back together. I even included some pictures so you can see the devastation for yourself! All in all – mission accomplished! 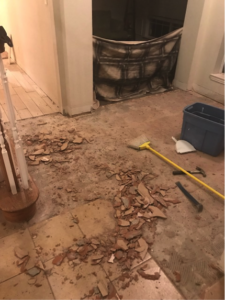 The family came back home to actual floors in the living room and kitchen, as well as a functioning bathroom! It’s what happened next which caught my attention because of how frequently it happens our household. I – being at times overly laid-back and without much desire to plan ANYTHING in advance – began thinking about the step right in front of us without much regard for the finer details necessary to actually “finish” the project. For example, I knew we had to put baseboards back on the floor. In my head, there was still a lot of stuff to do, but I knew baseboards was one of them. So, Step 1 became “Putting on the baseboards.” Check! That’s literally all I was capable of comprehending. Megan, on the other hand, began thinking about ALL of the steps and options necessary to finish our remodel. It involves changing the layout of bedrooms, moving our twin daughter’s bedroom across the hall, accessorizing our new space, and we need to get it all done in time for her parents to come visit in a few weeks for our girls 5th birthday party. The baseboards needed to get done, yes. But there was SOOOO much more that needed to go into it and, by her estimation, we needed to schedule out our next couple of weeks so we could have a plan of attack. Before I go much further, I should probably clarify where I’m going with this illustration. After all, I love my wife and I would like to be invited home after finishing this post. I am not trying to make the case one of us is right in our approach and I’m not trying to say one of us if wrong. There’s pros and cons to both. However, I am using this illustration because all of us – in our personal, professional, and social lives – are confronted daily with choices and subsequent decisions. It can be exhausting! Too often we’re stuck torn between too many options, a perceived lack of decision-making authority, or just plain fear of getting the decision wrong. There’s a time for deliberation and discussing all the options. There’s a time for collaborating with all the impacted parties to make a decision. Then again, there’s also a time when you just need to make a decision and go. Don’t overwhelm yourself with ALL the potential outcomes and risk. Just make a decision – and move on to the next one which will inevitably come soon enough! Recognize the moment and label it in your mind. I use the term “impact” because it’s easy to assess the importance of the decision based on who is “impacted” by the results. Are people going to lose their job based on which alternative you choose? That might be a High Impact decision which requires more time. (Or maybe you’re a neurosurgeon. Then, if that’s the case, take your time. Deep breaths. And while we’re at it, why are you reading this? I’m not published in a medical journal. You should probably be studying something…..anything. Get back to work!) But my argument is 80% or more of your decisions will fall in the Low Impact category. Recognize them for what they are and it will help you move closer to action. If you’re still feeling overwhelmed, write down your “action”. Write out in words (in email, on paper, whatever floats your boat) the action you are considering taking. Sometimes seeing the action laid out definitively on paper allows the mind to further solidify which way you might be leaning. You can also pen some pros and cons if that’s helpful to visualize your action. The point of the exercise is to firmly decide which route you want to take, which leads us to our final step. Once you’ve made your decision, pick one thing you can do today…. and do it. Often it’s easy to get paralyzed by all the steps needed to accomplish something. Maybe your decision point is a home improvement project like mine. Maybe it’s something larger like a career move, relationship goal, or a decision to move to a new home/state. Instead of focusing on ALL the things that play into making this decision a reality, pick one. Any one and do it. If it’s home improvement, buy supplies. If it’s a career move, update your resume. You get the point. Don’t be paralyzed by all the details and instead focus on one thing which moves you in the direction you want to go. The rest will come as you stay committed to the action of one thing at a time. I hope this helps you take more action and stop overthinking the small stuff. I’m off to try and continuously trick Megan into thinking she made a smart decision 9 years ago. Wish me luck and talk to you soon! "Watching our conference attendees captivated and responding with loud bursts of laughter, I knew we had a successful launch to our 3 day conference."